Thanks to winning a contest over at Dad of Divas, I was able to check out the new book Geek Dad: Awesomely Geeky Projects and Activities for Dads and Kids to Share by Ken Denmead. I was instantly overwhelmed, but in a very good way. The book recognizes that not every dad is your stereotypical sports-loving, beer-drinking man. Some of us like Star Wars, role playing games, and other things of a geeky inclination. Since dads love sharing their favorite activities with their kids, the question becomes: How do we share our love of science, technology and other geeky subjects with our kids? Sharing some items might be easy. You can sit down with your kid and have a Star Wars marathon, but others might not be as easy to share. Chances are, a 7 year old won’t quite understand or have the patience for an adult-level role playing game. Geek Dad is full of interesting ways of sharing these geeky interests in kid-friendly ways. 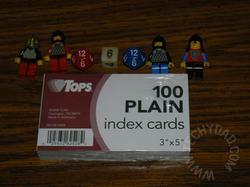 For example, what do 4 Lego minifigs, 2 12-sided dice, one 6 sided dice, a bunch of index cards and some posterboard have in common? Answer: The beginnings of a math-based, role playing board game inspired by the Create The Ultimate Board Game chapter. More on this as we continue to work on the game. Consider those photos a sneak peek. 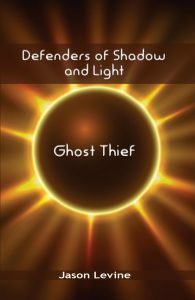 Getting back to the book, it was very well written and each chapter stands on its own (thus letting you skip ahead to a project or without needing to read three other chapters prior). So if the book is well written, why was I overwhelmed? Because there were simply too many good ideas in there. There are at least four or five projects that I want to do with NHL in the short to mid term and a few that I’ll save until he’s older. There’s even one project that has inspired me to make plans to improve upon it (The “Magic” Swing). I had to start shelving plans lest I try racing off in a dozen directions at once. So we’re focused on the board game for now and will explore those other paths later. You can buy Geek Dad for $9.76 on Amazon.com. It even qualifies for free shipping if you reach $25, so load that order up with some geeky supplies while you’re at it. While you wait for your book to arrive, be sure to stop by Wired’s GeekDad blog and GeekDadBook.com. 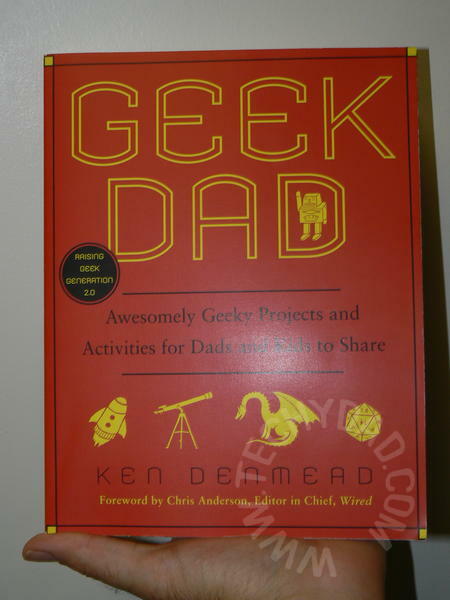 I’m happy to announce that I’ve been given the opportunity to give away a copy of Geek Dad: Awesomely Geeky Projects and Activities for Dads and Kids to Share by Ken Denmead. 1 Bonus Entry – Follow me on Twitter @TechyDad. Post a comment here with your Twitter username. 1 Bonus Entry Per Comment (limit of 3) – Post a comment one of my other posts from May or June. Be sure to leave a comment here telling me which post you commented on. To enter, please follow the rules above within the comment section. Contest starts today June 20th and ends at Noon EST on July 5th. You don’t need to be a blogger to enter, but I do need you to leave a valid e-mail address in your comment so I can contact you for your mailing address once the giveaway is over. I’ll select the winner using random.org and will contact you via e-mail. Once the e-mail is sent, you will have 48 hours to claim the prize. If there is no response, another winner will be selected. Open to U.S. residents only. Disclaimer: As stated above, I received a copy of Geek Dad via a giveaway on Dad of Divas. I haven’t received any compensation for this review/giveaway. The opinions expressed here are my own. I’d love to win this for my husband. He and I both look forward to taking our daughter (she’s 13 mos) to the great museums near us. We both look forward to the Natural History museum, but I really want to take her to the art museums and he can’t wait to get her into the Air & Space. I already picked up this book as a Father’s Day Gift, but then couldn’t wait to give it to my husband. Somehow, I think my son ended it up with the book! I would love to share my childhood interest of Legos w/ Tessa! Fish tanks – salt water and fresh. I too follow you on Twitter. I would like to share my interest of basketball and baseball with my son. This sounds like a very cool book! I have loved computers since I was a little girl and have been happy to pass along that love to my son. My hubby is into electronics and has always loved passing that along to our son as well – always some sort of project or experiment going on. I’d go back and try again to share my love of comics. Sure they’ve morphed into graphic novels but the immediacy is still there in the stories. Life, death and super powers for the win. Todd Jordan recently posted..Where or where has my port call gone? I’d like to share my interest in biking (or general action sports if Miloh wants to be a pisser and skateboard) because I still have my 1988 Haro Master and I’d love for him to ride it someday. I really want to share my love for science fiction and fantasy with my boys. I can’t wait until they’re old enough I can read The Hobbit to them. That is a great idea for a book! Kudos to you. Well…I got to, surprisingly, share my interest in miniatures with my children when we visited my old home where my doll house collection still resided. 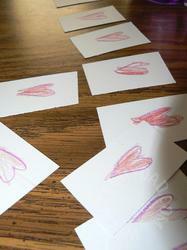 I have boys so I thought that was something I could never share, but they were fascinated. Played for hours. I was happily surprised. I have been able to get all my kids into the Star Wars movies, etc. They really get into the Star Wars Lego game on the Playstation 3… I have to fight with them to keep them back from the TV, otherwise I’m afraid their going to break the screen. I even had one recently tell Grandma “Your Jedi mind tricks won’t work on me’, out of the blue. We all almost fell on the floor. 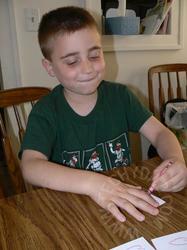 I’d love to share my love of baseball cards with my son. I remember being able to quote the statistics on the back of the card verbatim for many of my favorite ball players. The only problem with cards these days is there are too many to choose from. Plus, many of the “special edition” cards have taken away the nostalgic feeling of finding one of the rarer cards. Now you get one in every pack, but it is whether or not you get the expensive one. Just loved to collect to collect … not build wealth. and you can see me following you from @moth_editor. Great giveaway.